You are currently browsing the tag archive for the ‘Lesley Randall’ tag. for a day of mini-workshops and fun exploring techniques and supplies. Bring your own lunch or purchase from the Arboretum Café. This day of botanical art is designed to allow participants of all levels an opportunity to enjoy a hands-on botanical art experience in different mediums. The day starts with a presentation about botanical art. Then, each participant can choose any combination of four (4) one-hour, hands-on workshops taught by skilled BAGSC instructors. Registration is for the entire day—no pre-registration for individual workshops is required. All basic supplies, including paper and paint, are included in the price. 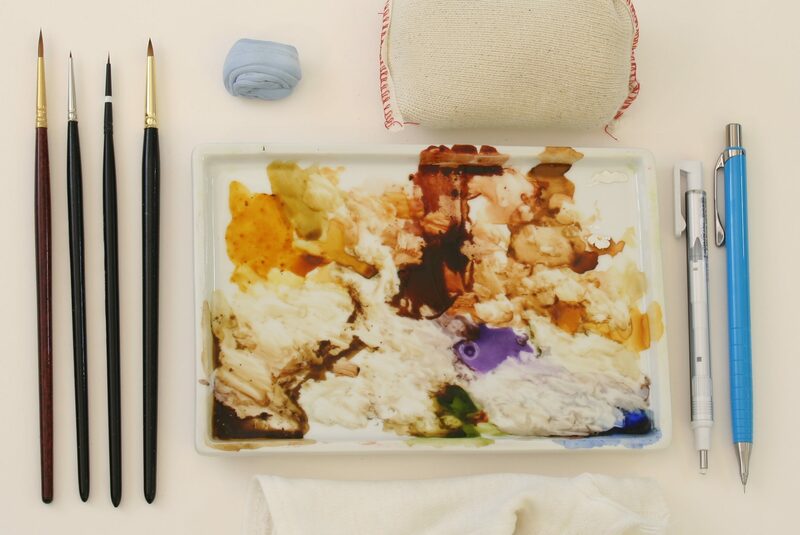 Additionally, most artists will bring special supplies to share that can be used with their techniques. Participants are welcome to bring some of their supplies if desired. Please see the lists in the right-hand column of BAGSC’s website about the class. Questions about the Workshop? Contact the BAGSC Education Chair. Lesley Randall with one Aristolochia gigantea flower. Photo by Jude Wiesenfeld, © 2018. 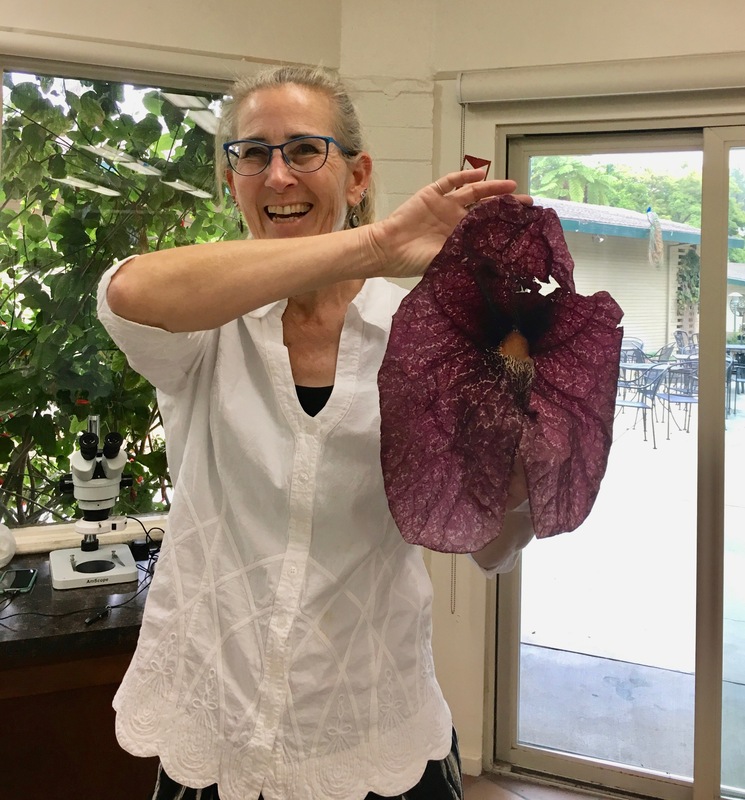 Lesley Randall’s workshop, held at the LA County Arboretum and Botanic Garden in Acadia, was very informative, focusing on Aristolochiaceae, commonly known as the Dutchman’s Pipe Family of plants. Lesley began the workshop with a lecture on the origin of the Aristolochiaceae. They ﬁrst appeared about 30 million years ago, when most of us were barely starting our careers! We examined, both in hand and through our microscopes, the distinguishing characteristics to look for while drawing. Lesley encouraged us to write down measurements and notes on the specimens for future clariﬁcation in our drawings and to include for illustration work. 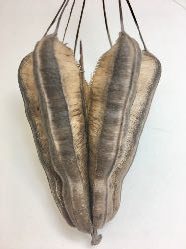 Aristolochea gigantea seed pod. Photo by Jude Wiesenfeld, © 2018. It was fascinating to see how the diﬀerent techniques (stippling vs. lines) gave a variety of results. Sometimes a broken line worked better than an unbroken one! Lesley supplied great examples of this in handouts. The ﬁnal drawings are started with an outline and then the details are added with stippling. It is important to stipple with a purpose: i.e., namely to clarify a characteristic, show shape, create depth and/or show color pattern. Also, Lesley stressed how important it is to keep your paper, hands and workspace CLEAN. Lesley encouraged us to research other artists’ work to learn about technique and mentioned Bobbi Angell as someone to study. 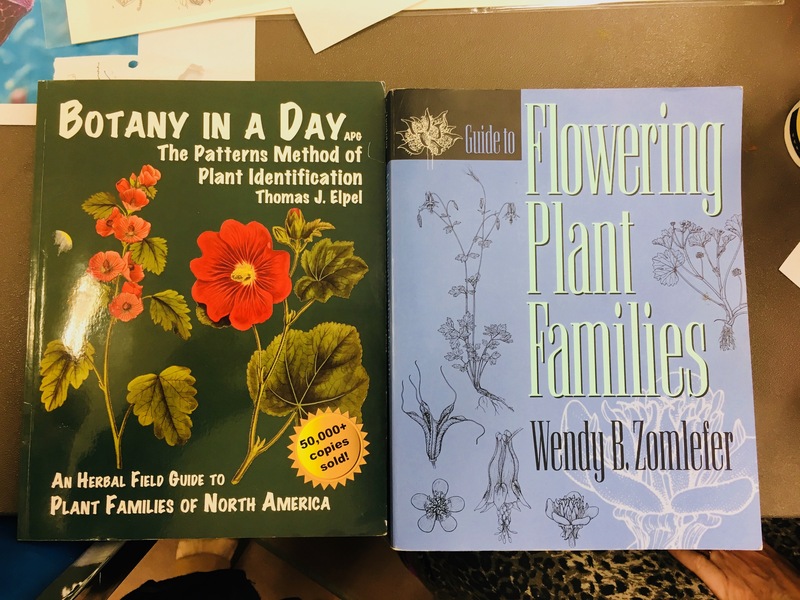 Two books recommended by Lesley Randall: “Botany in a Day: The Patterns Method of Plant Identification” by Thomas J. Elpel, ISBN-13: 978-1892784353, ISBN-10: 1892784351; and, “Guide to Flowering Plant Families” by Wendy B. Zomlefer, ISBN13: 9780807844700, ISBN-10: 0807844705. Photo by Jude Wiesenfeld, © 2018. Lesley Randall discussing the intricacies of the Aristolochea gigantea. Photo by Jude Wiesenfeld, © 2018. L to R: Lesley Randall, Pat Mark. Photo by Jude Wiesenfeld, © 2018. L to R: Pat Mark, Cynthia Jackson, Lesley Randall, Yulia Feldman and Leslie Walker. Photo by Jude Wiesenfeld, © 2018. L to R: Sydney Tanner, Lesley Randall, Leslie Walker’s hands, Cynthia Jackson. Photo by Jude Wiesenfeld, © 2018. L to R: Pat Mark, Sydney Tanner and Lesley Randall. Photo by Jude Wiesenfeld, © 2018. L to R: Lesley Randall, Leslie Walker. Photo by Jude Wiesenfeld, © 2018. My pen and ink drawing from the workshop. The line work is uneven, BUT I had so much fun! Artwork and photo by Jude Wiesenfeld, © 2018. Lesley was a fantastic teacher and very generous with us all. I hope she will consider other workshops in the future. Resolving to Take More Botanical Art Workshops in 2018? The workshops above have been posted on the BAGSC website under ‘Classes’; and on the calendar on the BAGSC ‘Members Only’ website page. Stay tuned for more information on the website, on this blog, and in email blasts to BAGSC members. Additional workshops, lectures, field trips and meeting programs will be announced soon. The 20th Annual International Exhibition by American Society of Botanical Artists and The Horticultural Society of New York was on display from November 09 – December 21, 2017 at The New York Design Center. Congratulations to all ASBA artists who participated, including BAGSC members Asuka Hishiki, Joan Keessey, Lesley Randall, Olga Ryabtsova, and Mitsuko Schultz. Forty-six works from more than 200 submissions were chosen, including artists from the United States, Australia, France, Germany, Japan, Slovenia, and the United Kingdom. Jurors were: Susan Fraser, Director, Mertz Library, The New York Botanical Garden; David Horak, Curator of the Aquatic House, Brooklyn Botanic Garden; and, Esther Klahne, Botanical Artist. The New York Design Center hosted the 20th Anniversary exhibition and reception. If you weren’t able to see the exhibition or the opening in person, you can still view the artwork online on the ASBA website, as well as read statements about their work from each of the artists. Click any of the images below to see an enlarged image and a slide show of BAGSC members in the exhibition. Congrats to all! The 14th International Exhibition of Botanical Art and Illustration by The Hunt Institute for Botanical Documentation has been traveling around the United States for the past two years. Its final stop is at the Petaluma Arts Center in Petaluma, California, for a botanical art exhibition entitled Floribunda, which will run from October 16, 2016 through December 11, 2016. Floribunda is a celebration of all things floral, featuring the 36 artists from nine countries in The 14th Hunt exhibition, including BAGSC members Leslie Randall and Deborah Shaw. Additionally, the Petaluma Arts Center will feature the work of Aimee Baldwin, Evan Kolker and Randy Strong—three Bay Area artists who create three-dimensional representations of flowers. Thursday, November 10: Artists’ Talk with Evan Kolker and Randy Strong, 7:00 pm; doors open at 6:30 pm. Nina Antze, Martha Kemp, Lucy Martin and Vi Strain, will demonstrate botanical art in a variety of media starting at 1:00 pm on Saturday, November 5, 2016. The demonstrations are free. Details and ticket information can be found on the Events page on the Petaluma Arts Center’s website. To arrange for group visits or school tours, email or call Kim at (707) 762-5600 x104. Following the 14th International Exhibition at the Hunt, the travel exhibition went to the Southern Alleghenies Museum of Art—Loretto and was on display from October 18 through December 6, 2014. The exhibition then traveled to the Fellows Riverside Gardens in Youngstown, Ohio where it was on display until January 10, 2016. The Petaluma Arts Center is located in the historic train depot at 230 Lakeville St, Petaluma, California, 94952. Gallery Hours are: Thursday through Monday, 11 am-5 pm. The gallery is closed Tuesday, Wednesday and holidays. 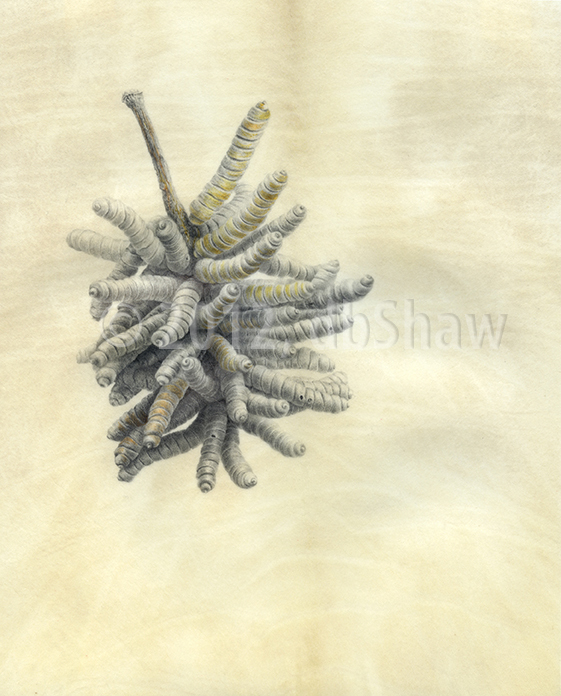 Prosopis pubescens seed pod (Screwbean Mesquite, or Tornillo), watercolor and graphite on honey vellum, © 2012, Deborah Shaw, all rights reserved. Admission to the Petaluma Arts Center is $5 for general admission and $4 for seniors. Students, teachers, military, and PAC members are free. Pincushion Protea, watercolor and colored pencil on paper, © 2015 Estelle DeRidder, all rights reserved. The American Society of Botanical Artists and The Horticultural Society of New York announce the opening of the 18th Annual International at a new venue: the New York Design Center at a new venue. The ASBA’s longest-running collaboration, this prestigious exhibition will be held for the first time in mid-town Manhattan. The opening reception will be on Wednesday, November 4, 2105 from 6 pm – 8 pm. Awards will be announced at 7 pm. The evening’s events will begin with a book talk by author Amy Goldman at 5 pm. Limited seating is available. To attend Amy Goldman’s talk, an RSVP is required: scourtade@thehort.org. No RSVP is required to attend the opening reception. As always, the catalog of the exhibition is available through ArtPlantae, starting November 4th. BAGSC artists accepted into the exhibition include: Margaret Best, Melanie Campbell-Carter, Estelle DeRidder, Akiko Enokido, Asuka Hishiki, Joan Keesey, and Lesley Randall. Jurors for the exhibition were: Susan Fraser, Director, Mertz Library, The New York Botanical Garden; David Horak, Curator of Orchids and Aquatic House, Brooklyn Botanic Garden; Catherine Watters; Botanical Artist and ASBA Board Member. The New York Design Center is located at: 200 Lexington Ave. New York 10016, (212) 679-9500. 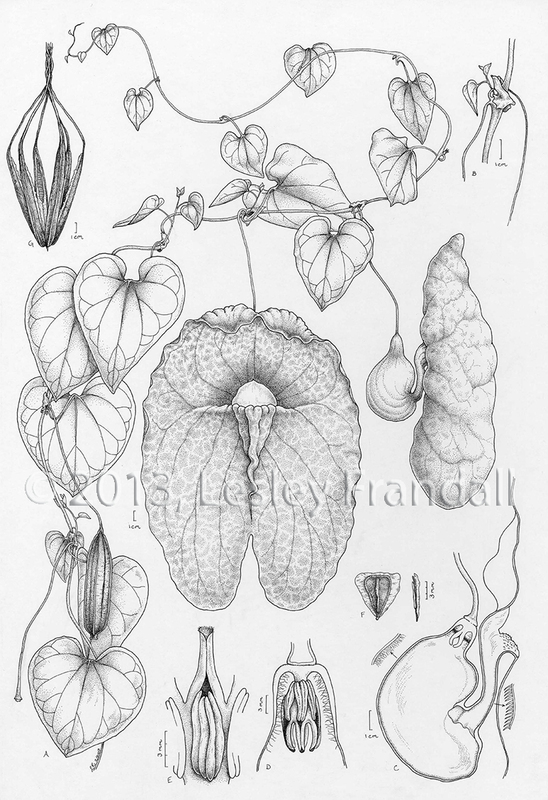 Aristolochia gigantea, ink on paper, Lesley Randall, © 2013, all rights reserved. Lesley Randall will be teaching a two-day workshop on pen and ink for botanical illustration in northern California. Sponsored by the UC Davis Center for Plant Diversity, this workshop is for students of all levels. The cost is $170.00 for Davis Botanical Society and ASBA members; $190.00 for non-members. Make checks payable to Lesley Randall and send to her address. Questions? Contact Lesley via email. Botanical illustration is an art with a long tradition. Although accuracy is the top priority, pen and ink botanical illustrations are art pieces of elegant beauty. Lesley will cover the basics from sketching to transfer and inking techniques. Types of papers and pens will also be discussed. All levels of experience are welcome! Students are encouraged to bring completed sketches so they can focus on inking techniques. Lesley has been an illustrator for 27 years. Her published work has appeared in The Flora of Yosemite National Park, The Jepson Manual, Invasive Plants of California’s Wildlands and numerous scientific journals. She has exhibited her work in Australia, the United Kingdom, New York City and California. 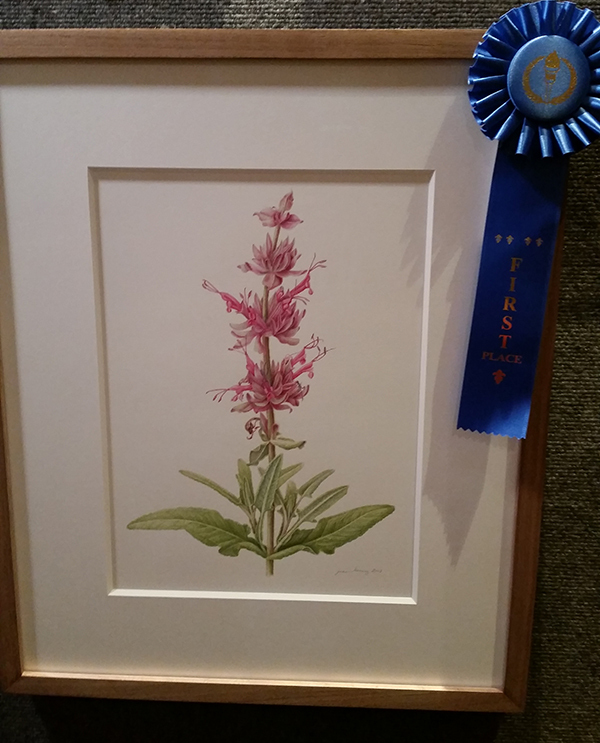 First place winner, Joan Keesey, Salvia spathacea, watercolor. © 2014, all rights reserved. The California Native Plant Society (CNPS) held their Conservation Conference in San Jose, California this past January 15 – 17, 2015. 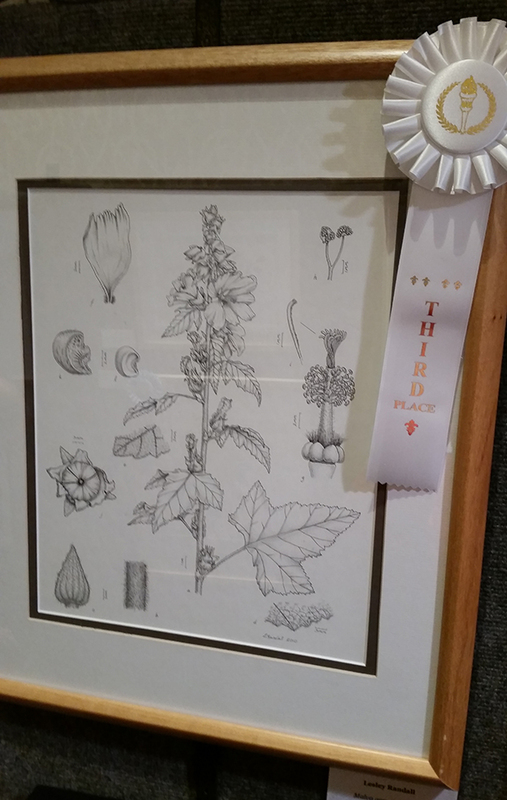 BAGSC members Joan Keesey won first place in the Botanical Art Exhibition with her watercolor of Salvia spathacea, and Lesley Randall took third place with her pen and ink drawing of Malva assurgentiflora. CNPS awards cash prizes of $500 for first place; $300 for second place; and $200 for third place, plus publication in the CNPS magazine, Femontia. The CNPS conference was attended by about 1200 people—all of whom are passionate about California’s native plants. Bernard Halliwell and Kristin Jakob worked very hard to put the botanical art exhibit together and did a magnificent job. Although they had only a small space with which to work, the exhibit flowed very nicely. As always the standard of work was exceptionally high. 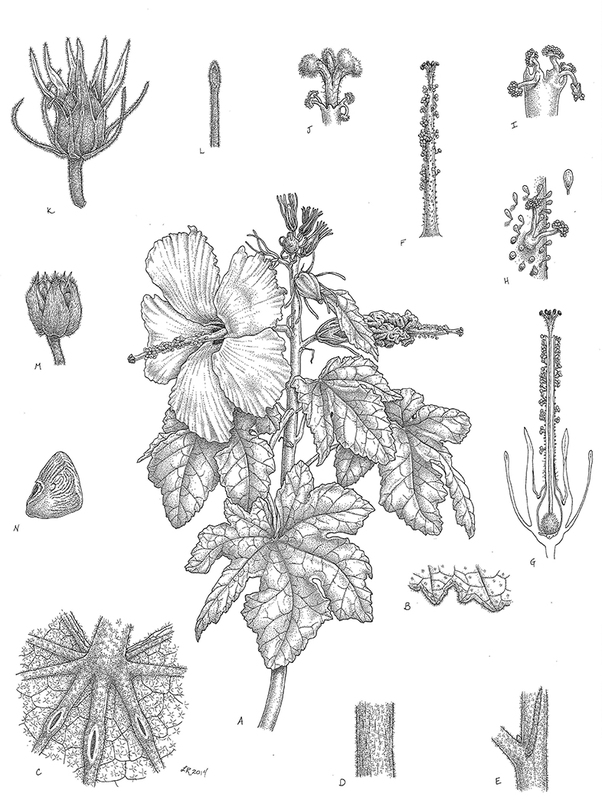 Third place winner, Lesley Randall, pen and ink of Malva assurgentiflora. © 2014, all rights reserved. This year, the conference also included botanical art talks and demonstrations. 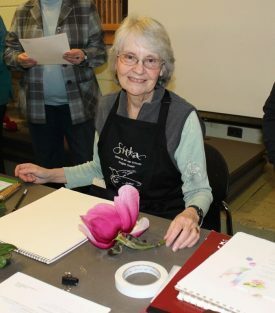 Pria Graves gave a talk about The History and Tradition of Botanical Art; Lesley Randall taught a workshop on Pen and Ink Drawing of Plants; Nina Antze taught a workshop on Drawing Plants with Color Pencils; and Maria Cecillia Freemen taught Getting Started in Botanical Drawing and Painting. Watch the blog as more images and information about the conference comes in. Congratulations to all for a successful conference, and kudos to Joan and Lesley! 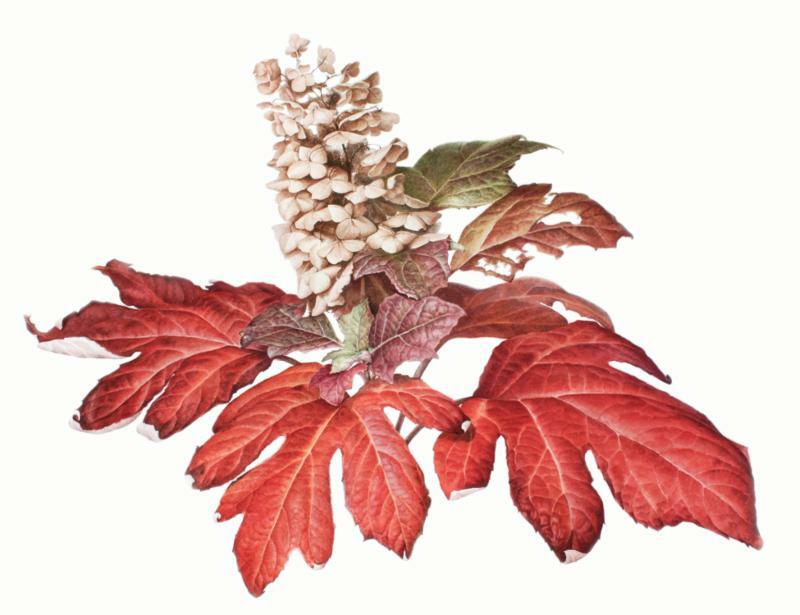 Susan Sapanara, Hydrangea quercifolia, Crimson Collar, watercolor on paper, © 2014, all rights reserved. Artists Carrie Di Costanzo, Ingrid Finnan, and Monika deVries Gohlke will share their personal stories behind their work and offer a unique perspective on the work of their peers. They will be joined by exhibition juror Patricia Jonas, who will provide insight into the artwork selection process. Registration for the “Last Look Walkthrough” can be found on Eventbrite. 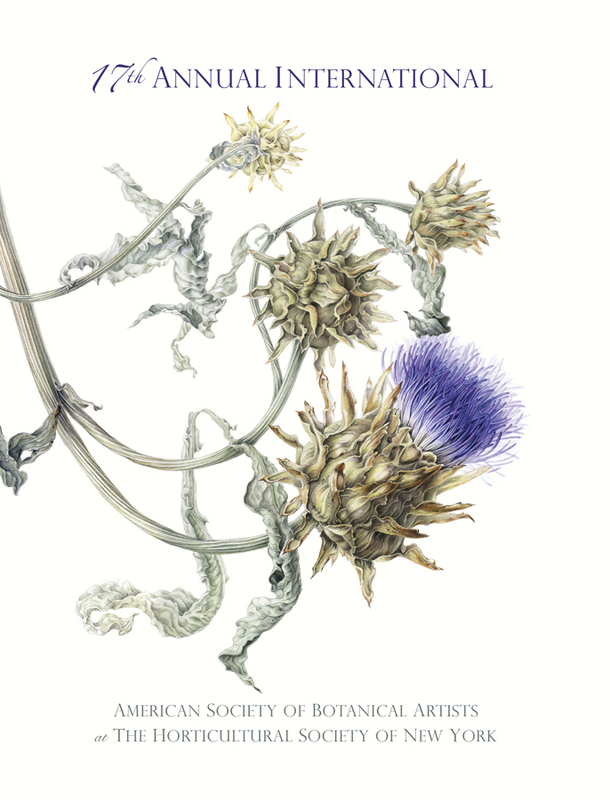 Catalog cover image: Annie Patterson, Cynara cardunculus, Cardoon, watercolor on paper, © 2014, all rights reserved. Catalogs for the exhibition can be purchased for $20.00 through ArtPlantae. The New York Horticultural Society is located at 148 West 37th Street, 13th Floor, New York, New York. The 17th Annual International is on display through November 26, 2014. Jurors Patricia Jonas, Marco Polo Stufano, and Catherine Watters selected 42 artworks out of 215 submissions from around the world. BAGSC members Joan Keesey, Lesley Randall, and Deborah Shaw have artwork in the exhibition, and Lesley Randall won the Brooklyn Botanic Garden Award for Drawing & Prints. The ASBA has posted the artwork and the artists’ stories behind each piece. Click on the links and on the ASBA website to see the artwork and read the artists’ stories. Dichelostemma volubile and Madia elegans. Watercolor © Joan Keesey, all rights reserved. 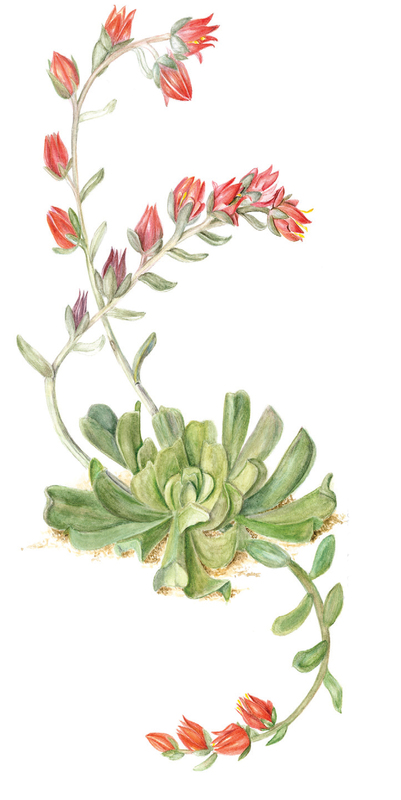 A quick reminder to my original blog post: the California Native Plant Society (CPNS) is holding a botanical art exhibit in conjunction with their Conservation Conference, January 15-17 in San Jose. The entry deadline for submission of artwork is November 1, 2014. They would love to see our artwork there. Artists are invited to enter original artwork in any two-dimensional medium that reflects the beauty and uniqueness of California flora and adheres to high standards of botanical accuracy. All entries must depict plants indigenous to California. More information is at the CNPS web site. You may also download the PDF form 2015 Prospectus CNPS Botanical Art Exhibition, or contact Bernard Halliwell. The Northern California Society of Botanical Artists (NCalSBA) will be helping with the exhibit and coordinating techniques demonstrations at the Conference. Lesley Randall will be coordinating BAGSC members who would like to help our NCalSBA counterparts. More to come on demonstration opportunities later! The ASBA announced their annual awards last night at the closing banquet. 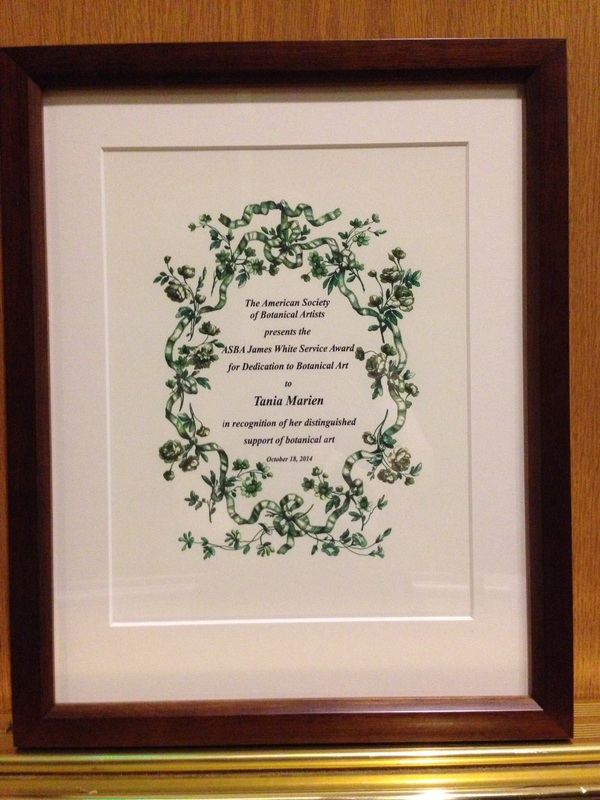 Tania Marien was presented with the James White Service Award for her dedication to botanical art, in recognition of her distinguished support of botanical art. 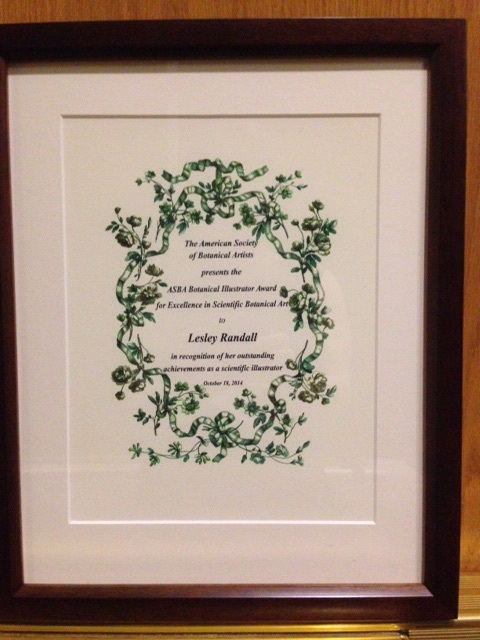 Lesley Randall was presented with the ASBA Scientific Illustrator Award for Excellence in Scientific Botanical Art, in recognition of her outstanding achievements as a scientific illustrator. George Olsen was presented with the ASBA Diane Bouchier Artist Award for Excellence in Botanical Art, in recognition of his outstanding acheivements as a botanical artist. Unfortunately, the three award winners were not present to receive their awards in person. When Tania and Lesley’s names were announced, however, the BAGSC table cheered loud enought to hear back in Southern California. Congratulations to the award winners for richly deserved recognition!! 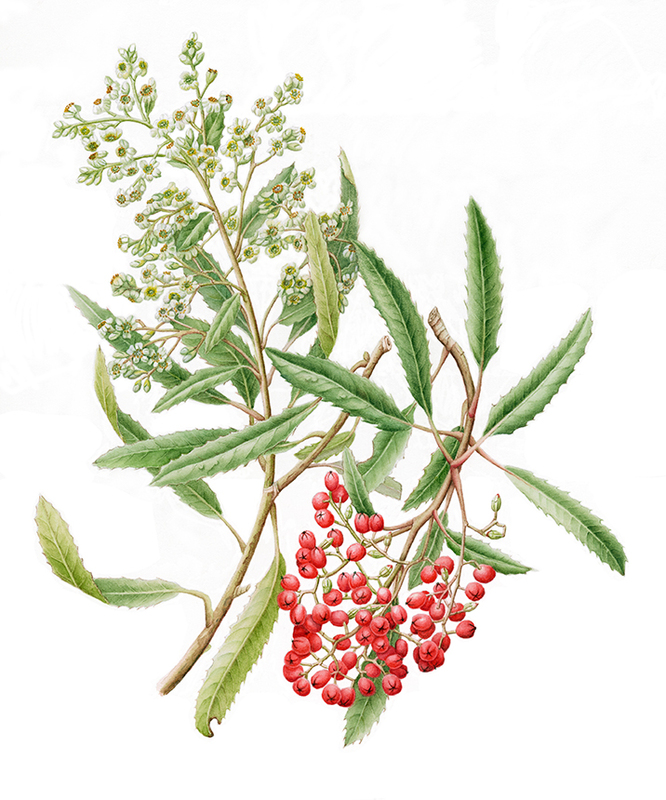 Joan Keesey, Heteromeles arbutifolia, California Holly, Watercolor on Paper. © 2013, all rights reserved. The 17th Annual International American Society of Botanical Artists opened on September 17, 2014 at The Horticultural Society of New York. The exhibition will run from September 17 – November 26, 2014. Jurors Patricia Jonas, Marco Polo Stufano, and Catherine Watters selected 42 artworks out of 215 submissions from around the world. The exhibition includes works by artists from the United States, Australia, Canada, France, Israel, Japan, and the United Kingdom. BAGSC members Joan Keesey, Lesley Randall, and Deborah Shaw have artwork in the exhibition. A full-color catalog with all of the artwork is available at ArtPlantae for $20, plus shipping. Lesley Randall, Ma’o hau hele, Hibiscus brackenridgei, pen and ink on board. © 2014, all rights reserved. The ASBA has posted the artwork and the artists’ stories behind each piece. Click on the artists’ names in this posting and on the ASBA website to see the artwork and read the artists’ stories. Deborah B. Shaw, Cucurbita maxima, Buttercup Squashes and Section, watercolor on paper. © 2013, all rights reserved. 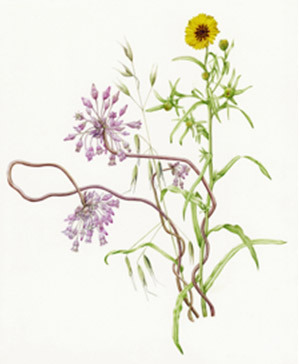 Botanical art workshops are being held in conjunction with the exhibition, and a “Last Look” reception with featured artists and jurors will be held on Wednesday, November 19, 2014 from 6-8 pm. The Hort is free and open to the public Monday through Friday, 10:00 am to 6:00 pm. For further information, please contact Chris Murtha at The Hort, 212-757-0915 (x121) or cmurtha@thehort.org, or Carol Woodin, Director of Exhibitions, ASBA, exhibitions@asba-art.org, 866-691-9080. Watercolor by Clara Josephs, © 2014, all rights reserved. The San Diego Botanic Garden and the Botanical Artists Guild of Southern California (BAGSC) will be holding an exhibition titled, Artists’ Favorites. These beautiful and unbelievably detailed works of art depict different plant species—several of which are found in the San Diego Botanic Garden. Forty-three works representing 18 different artists were carefully selected for this juried show. Each of the plants and paintings hold a special place in each artist’s heart. Artists include: Cristina Baltayian, Melanie Campbell-Carter, Diane Daly, Estelle DeRidder, Linda Ericksen, Cynthia Jackson, Susan Jackson, Clara Josephs, Joan Keesey, Suzanne Kuuskmae, Lesley Randall, Kirsten Rindal, Mitsuko Schultz, Gilly Shaeffer, Deb Shaw, Janice Sharp, Gayle Uyehara, and Leslie Walker. The Artists’ Reception is free, and is open to the public. Members, friends and family are welcome. Come and meet some of the BAGSC artists at the reception. The San Diego Botanic Garden is located at 230 Quail Gardens Drive, Encinitas, California 92024. The phone number is 760.436.3036. The San Diego Botanic Garden will be hosting a BAGSC exhibition of botanical art titled Artist’s Favorites. This juried show will feature botanical works near and dear to each artist’s heart. A work might be a favorite because of a particular plant specimen, because of a specific technique, or because it evokes a treasured memory of a place or time. This exhibition is not only “artists’ choice” for artwork, but “artist’s choice” for framing too! If you would like to stick to the ASBA standards of a light wood, simple, L-shape frame, feel free to do so. If you have artwork framed in other styles, this is your chance to submit them in the frames you’ve chosen. Consider volunteering to help with the “Artist’s Favorite” SDBG exhibition—we have a good time. 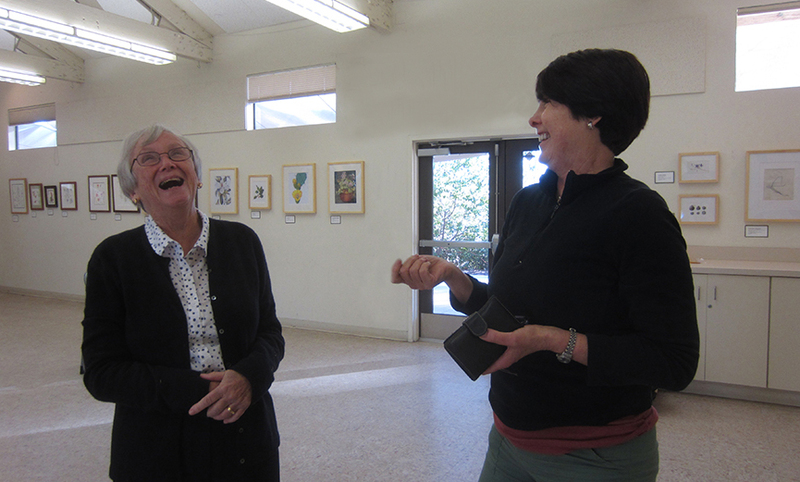 Photo of BAGSC members Joan Keesey (left) and Janice Sharp (right) enjoying a laugh during the hanging of the 2013 BAGSC exhibition at the SDBG. All BAGSC members in good standing (dues paid) are eligible to enter up to 4 (four) pieces, which may consist of original, two-dimensional botanical art and illustration in any media, or archival giclée prints of original artwork. No photography or digital art. Work may have been shown in previous BAGSC, ASBA, Filoli or other exhibitions. THIS IS A JURIED SHOW. It is possible that multiple entries may not be accepted, depending on space availability and the number of submissions. Artwork or prints may be for sale if desired. The San Diego Botanic Garden will take a commission of ten percent of all sales. A submission fee of $35.00 must be made out to BAGSC and sent with the submission form to BAGSC Treasurer and Exhibit Chair, Lesley Randall. Please write “Artist’s Favorite” on the subject line of your check. Your check must be received by Lesley Randall on or before August 15, 2014. If you would like to bring your submission check (and CD) to the BAGSC Pen and Ink class on August 9 and 10, 2014, OR to the July 20, 2014 BAGCS Quarterly meeting, please bring them then. An email blast also will be sent out to BAGSC members with the submission form and additional information. Details about artwork delivery and pick-up will be sent out to all accepted artists at a later date. BAGSC members are needed to help set up and break down the exhibition. and other show-related activities as needed. To volunteer for the activities above (or any other help you can provide) please contact Lesley Randall. 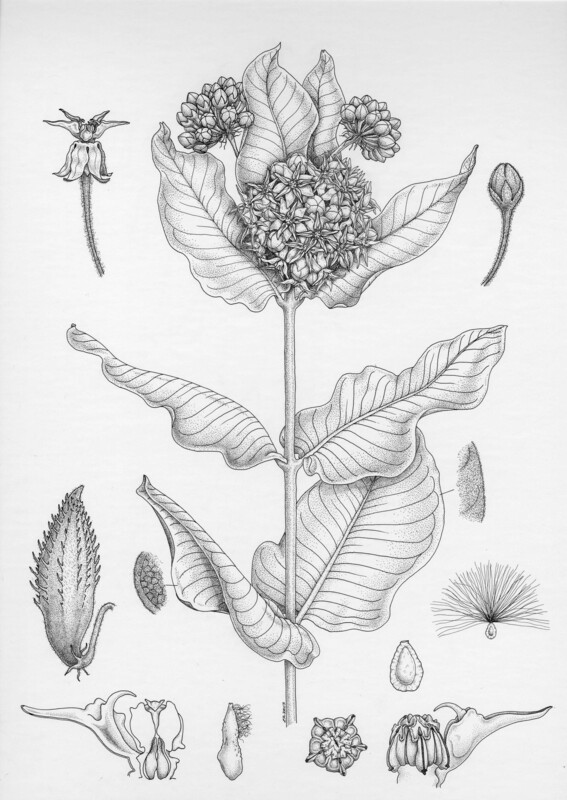 Asclepias speciosa, Lesley Randall, pen and ink on illustration board, © 2014. Pen and ink is an elegant art form and the traditional method used in botanical illustration. This class will cover the different techniques used to convey shading, the importance of using different line weights and choosing the appropriate paper. The class will focus on the legume family with a short lecture of the diagnostic characters given by instructor Lesley Randall. Students are not required to draw a plant from this family, however. Students must provide their own plant specimen to draw, with flower, fruit or seed pod if possible. Students are encouraged to have some pencil sketches completed of their subject to bring to the class. This will allow maximum time for working in pen and ink. All levels of experience are welcome. Coffee, tea and water will be provided, but please bring your lunch. A materials list will be provided upon registration. There is ample parking at the SDBG, but of course, we always encourage carpooling. Cost: SDBG and BAGSC members $200, non-members $220. A materials list will be sent upon registration. Lesley began her career in Davis California where she prepared illustrations for scientific publications. Her work has appeared in numerous journals as well as a few floras, including the Jepson Manual and An Illustrated Flora of Yosemite National Park. In recent years she has exhibited her work in international juried botanical art shows in the United States, Australia and the United Kingdom. While she works primarily in pen and ink, Lesley also enjoys working in color pencil and graphite. In addition to botanical art, Lesley makes leather masks and mosaics out of glass. She is currently employed at San Diego Botanic Garden as curator of plant collections where she finds many different plants to draw.